What is via ferrata!? / What is ​klettersteig? Imagine the hardest hike or scramble that you’ve ever done up a very steep hill/mountain. Now imagine that there are steel cables along the rock and handholds/footholds to help you through the hardest parts. You walk up/down ladders (while attached) when it’s very steep and move across short cable sections as you go up the route. When it gets difficult or steep, you’re attached to a short cable section to stop you from slipping even if you misstep. The photo below shows me doing a via ferrata in Kentucky. Note my harness, the footholds/handholds, the steel cable, my helmet, and the rock. The idea is that a course is set and the minimum number of rungs/cables are set to allow you complete the course while remaining safe. Obviously,the courses vary in difficulty. The easiest via ferratas allow you to take a short walk with the safety of a cable/ladder to experience a fantastic look-out from above (similar to the photo above) while the hardest ones can be both very difficult and very long climbs through mountainous areas with no climbing aids and exposed rock. It was first invented as a way of traveling and fighting in the Dolomites during World War I by the Italians and the Austrians. You can still see/climb some of the old military routes today in the heart of the Dolomites, which is quite cool. Today, it’s popular among Italians who treat it like most of us treat hiking: a fun way to get some exercise. It’s most popular in summer when you don’t need to worry about snow in the mountains, which can be an issue in winter/fall/spring depending on the location. Why try out Via Ferrata? Exercise! You will be surprised how sore you are the next day in the arms. Incredible views of hard to access areas. Imagine discovering a secret waterfall that nobody else can see except within the gorge you’re climbing up (photo below). Can be done solo unlike many other forms of climbing. Most of all, it’s fun. Do I need a professional guide for klettersteig? How much to hire a via ferrata guide? If you live in the US, there are via ferratas located in Kentucky, California, Colorado, Vermont, West Virginia, and Utah that will carefully explain everything and take you on your first via ferrata. This isn’t true for every country as many via ferratas are not as regulated, but it’s possible to find a guide. This is especially true in the mountains areas in Italy, France, Switzerland, Austria, Germany, and Slovenia. There are via ferratas in other countries all over the world, so it’s worth looking into options close to you. ​If you’re looking for guides, more than $200 USD for one day is on the high end as you can typically try it out for roughly $100 per person with a guide and equipment for one day if you’re in an area with many via ferratas. If you’re considering it on your own, the internet has a lot of resources in terms of via ferrata routes/advice, but I would still recommend buying a Cicerone Guide if available. It’s a succinct guide to the local routes that will help you find the beginning of the routes and assess difficulty. I should warn that even if you read about a route online, it might be very difficult or impossible to find without a guide. Most via ferratas are fairly remote, so you might need to take a ski lift, a long hike, or even drive to a small local cemetery (like we did) in order to find the route before hiking for 2 hours. Finding the beginning is non-trivial and it can be helpful to have a GPS locator to locate some of the routes you’ll find on SummitPost or Wikiloc. A climbing harness. Any climbing harness that fits you well (they are sized) and is in good condition will do, however this can be rented if you don’t own one. This can be used for any climbing activity, so it’s a good investment. I recommend measuring yourself prior to ordering one as your harness should not be able to go over your hips. If you’re looking for a good harness, I am a fan of Black Diamond and Petzl. I use a Petzl harness myself as they have slightly more options for women. A harness is a great investment for climbing more generally! Click for the women’s climbing harness & the men’s climbing harness that we use! Carabiner. You use this to allow you to rest attached to the cable or the rungs. It’s better to get a large carabiner with a screw lock (instead of a ball lock) in case emergency resting to make it easy for you to get connected to the rungs. Via Ferrata Set / Via Ferrata Kit This is your lifeline. This is how you are attached to the cable, but this is for emergency use only. If you fall, there is an Energy Absorption system inside the little pack that prevents you from falling off the rock as long as you’re hooked into the cable properly with both clips attached. I’ve heard that it takes a decent fall or a mistake that prior to the fall to damage it, but if you have a fall, it is standard practice to check that it is not damaged. If it is damaged, you have a serious problem. This is the exact via ferrata kit that I have. I liked how large the clips were compared to some others that I’ve rented while climbing prior to buying my own! ​This is also referred to as the via ferrata lanyard, however this is not a normal lanyard. You cannot use any kind of lanyard. This is specialized climbing equipment that can save your life. For anyone trying it out without a guide, find out a tear/rip looks like in the seam from an expert. This might save your life if you have a fall, but you’re not sure if your gear is damaged. I researched my gear a lot and I ended up buying the Easy-Rider from Black Diamond, which has large clips that allow you to clip into the cable more easily. If you’re renting via ferrata gear, have an expert carefully check your gear for any rips/tears before you go. Also, ask them what a tear/rip looks like if you’ll be doing it without a guide. Climbing Helmet. This is required as you’re often climbing directly on the rock and rock MIGHT fall on you. Jacob actually witnessed a rock fall on someone during a via-ferrata, but luckily their helmet stopped anything serious from happening. More generally, if you know there’s falling rocks, don’t look up and keep your head down to protect yourself better. Rentable from anywhere that rents via ferrata gear. I own the Half-Dome climbing helmet from Black Diamond . Climbing Gloves. Your hands will get cut up from gripping the rocks. Similarly, your hand will sweat a bit, so it makes it a lot easier to grip the rocks. It’s better to have half-finger gloves due to being able to use your fingertips. This is optional, but I’ve seen it make a huge difference in my own climbing. Not rentable, but cheap and worth it. I bought my climbing gloves from Black Diamond. Minimal fear of heights. Admittedly, I get vertigo sometimes, but if you’re not comfortable with climbing tall ladders and hiking with a drop below you, this may not be for you. Water & Snacks. You’ll be in a remote mountainous place–so bring a good water bottle and snacks to keep you going! I swear by my Nalgene bottle as I hook it on the side of my backpack to leave space for my gear. Travel Insurance. Just in case. If you’re going without a guide, a good backpack to hold your gear and your food/water. I use a military backpack as it’s sturdy and allows me to wait to put on my gear until I reach the start of the via ferrata trail (which can be a bit of a hike). I think the most important thing is that your backpack as a strap across your chest/stomach to minimize movement while you’re climbing..
Surefootedness. It’s the ability to be sure in your steps and trust yourself when you’re hiking on a path. I admittedly struggle with this, but this improves the more that you hike and do via-ferrata. Comfortable sports clothes that fit tightly. Bring an extra layer (sweatshirt) since it can get cold at higher elevations. I recommend wearing full coverage pants that are a bit thicker as you might need to crawl–which means that your knees might get cut up. Sturdy Hiking shoes and/or via ferrata shoes. ​Typically, you’ll need to hike and climb ladders, so you don’t want to use rock climbing shoes if you own them. The grip is important as I often find the rock is the best way to get a good foothold and sometimes, you’ll need to climb using wet rock. A good pair of via ferrata/hiking shoes that go above your ankle are a good idea to prevent you from ankle-injuries, but not necessary. They must be closed (no open sides). Where can you do via ferrata? Look up via ferratas close to you. My favorite place to look is on Wikiloc for routes, but I often go to Youtube to get a feeling about the route although it’s hard to access difficulty from watching a youtube video. The Dolomites in Northern Italy (you can fly into Venice or Verona). Southern Dolomites: Close to Lake Garda/Brentas. If you’re considering this region, Arco is the major hub for climbing and you will be able to rent via ferrata equipment. 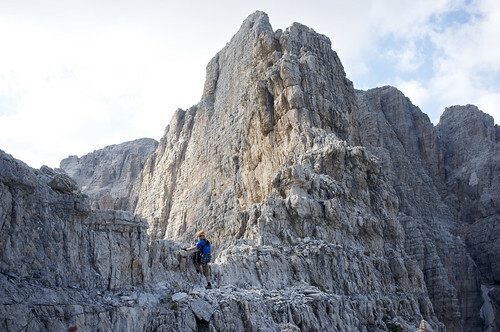 Northern Dolomites: Canazei, Belluno, Cortina and Bolzano Cortina is a major hub for climbing and I believe you can rent via ferrata equipment here. If you’re considering doing a vacation here, you can actually take a ski lift up to a high point and do via ferratas in between mountain huts. Austria. The largest number of via ferratas of any country. We did quite a few close to the Dachstein glacier, not far from Salzburg. France. Mostly in the Pyrenees mountains mountains closer to Toulouse, however there are some via ferratas closer to Lyon/the Italian border. Germany has many via ferrata routes around the country. You will find many in the Alps close to Munich. Romania has a few via ferrata routes, however some are illegally installed, so read up carefully about the routes before deciding to do so and find out if the cables are intact prior to going. Triglav National Park in Slovenia and the Julian Alps Full of beautiful lakes and incredible via ferrata routes. You can rent equipment in Bled although it is easiest to bring your own. In the United States, I have personally done Nelson Rocks and Torrent Falls on the East Coast in West Virginia and Kentucky. Both are quite different, but incredibly fun. There’s quite a few in the Rockies and some now in the Southwest, but I’m not as familiar with these. Nelson Rocks is a longer via ferrata located in West Virginia that is 4ish hours. It’s not technically difficult, but it’s quite beautiful and you will be quite high up. You are climbing up these two strange fin formations seen below. You go with two well trained guides who will help you through any difficulties (or just nervousness). The scariest moments depend on the person, but I’d say it was turning onto the fin for me with the drop below me and walking across the bridge for a friend of mine! The whole area is STUNNING and even more so in fall with the leaves turning. Torrent Falls. Located in Red River Gorge, Kentucky. It’s more of a technical training course, as it has several separated courses of different levels. It’s nice since you have the opportunity to try some courses above your level (and fail miserably) as well as rest/get a snack between courses. I’ve been here twice now and the staff is incredibly knowledgeable. Have you done a via ferrata? If so, where? If not, would you try it? Wow this looks amazing. So out of my league but wish I had the courage to do it. The views look amazing. Such great info for a beginner! Sarah, I promise it’s really not that bad. There are some via ferrata routes where all you do is just clip yourself in, climb a little, along the rock, and take in the view. Hope you get to try it! Just wanted to ask you one thing – hasn’t Italy got the biggest number of via ferrata trails? That’s one seriously impressive thing to do – Most of my favourite adventure movies involve mountain climbing such as North Face, Touching the void etc but I think it’s because I’m so terrified of the thought of doing it myself! How cool are those dolomites….awe inspiring! Derek, I actually have a (reasonable) fear of heights. I would definitely recommend trying via ferrata as it gives you a taste of mountain climbing without the dangers of doing true mountain climbing. I promise via ferrata is safe as long as you have good technique. AMAZING!! This looks so great! I have actually been to that place in Spain! I love new kind of adventures!! Great photos, looks beautiful! I had no idea this was anything outside of Italy! I adore hiking, but have never tried this. Wow, looks amazing. Amazing photos and descriptions. I give you so much credit for doing this; you should be so proud!! Actually, your harness will combined with careful via ferrata technique, but having good grip helps you not fall. You’re typically at most around 1-2 feet max from the wire as sections are short and you just have enough room to move safely, so it’s not very far to fall even if you slip a little as the via ferrata ropes are set up to catch you to prevent you from falling more than one section. I have definitely slipped, however it just means I just let myself dangle for a minute or so while I rest. Then, I just pull myself up and keep going. Compared to a lot of other types of climbing, it’s actually quite safe. Technique is essential as you need to be always clipped in with both clips on the wire, so even if you fall, you’re safe. A common beginner mistake is to hook yourself while high-up at a “safe” look-out point where the rock is flat, but this is a big mistake to avoid.The gloves are just a matter of preference as my hands often get cut up. Thanks so much for reading! It’s so exciting! Thank you for sharing such awesome photos! Would love to try this. Will look into Telluride Colorado, not far from us. My husband and I did the Nelson Rocks course this past October and loved it. I’ve been researching other locations so your post is timely. Thanks for the info! Nice! I’d love to hear about where you end up going for your next trip and how it is! Thanks so much for reading Karla! I do a lot of hiking, which I share over on my blog, and recently passed my beginners inside climbing course, but am yet to head outside and try my skills. Via Ferrata sounds like it makes everything so much more accessible. Thanks for such a detailed post, I’m definitely going to try it now! I have not ever heard of this before, it looks quite intense. Not sure I can get my courage up to try it though.